Blending influences from the East and West, the old and new, Jiang Li is a Chinese artist who creates a rich visual tapestry that successfully combines the traditions of Asia with techniques of contemporary expression. Emerging from China’s Cultural Revolution and coming from Yunnan School, where he studied under Ting Shao Kuang, one of the school’s founders, Li is a part of the second wave of Yunnan artists. He manages to merge influences of his Chinese cultural heritage with Neolithic images, designs originating in Bronze Age, but also post-Han literature and the philosophy of Taoism. The imagery and colors are also inspired by the Buddhist cave paintings of the Silk Road as well as the setting of the Yunnan Province’s verdant jungle and its exotic tribal inhabitants. Trough his paintings, Li is showing a body of work whose creation springs from flesh interest and deeply rooted attachments. His original works have been reproduced and published in various media, including posters, serigraphs, ceramic, woodblock, bronze, and of course, books. Galleries throughout Asia, South America, Canada and the USA have shown his pieces. He emerged from the Chinese Cultural Revolution but eventually moved to the United States of America (in 1989), seeking full and untainted artistic freedom. 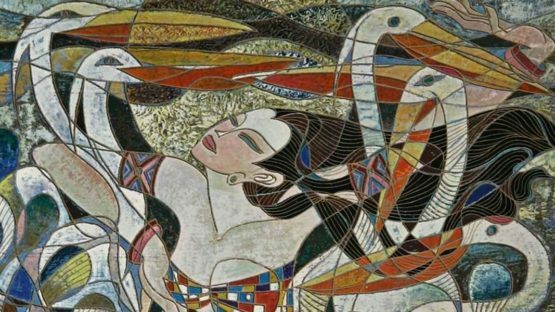 Among others, Li came from the Yunnan School, and all of them shared and used the rubble of the Cultural Revolution as a basis for their improvement, and they were a fresh breeze in the art world. Captivating both east and west, they have managed to create a new synthesis of international art trends and Chinese resources. Speaking of Li, his work can be described as a tribute to and an exaltation of the human spirit. His paintings are songs of life, singing in the universal language of art, deeply immersed in passion, pulse, and power. The images as the lyrics and lines as the music, the theme itself is the universality of all mankind. An aesthetic testimony to the affirmation of the human presence, Li’s paintings are exultations of the human spirit and man’s quest for alignment with universal law. He has also worked as a graphic designer and artist for a book publishing company, winning the first prize in a national competition in 1985. Jiang Li lives and works in Los Angeles, California.